The CANDLES Museum hosts an annual tour of Auschwitz with Holocaust Survivor Eva Kor. This year, I am lucky enough to attend. 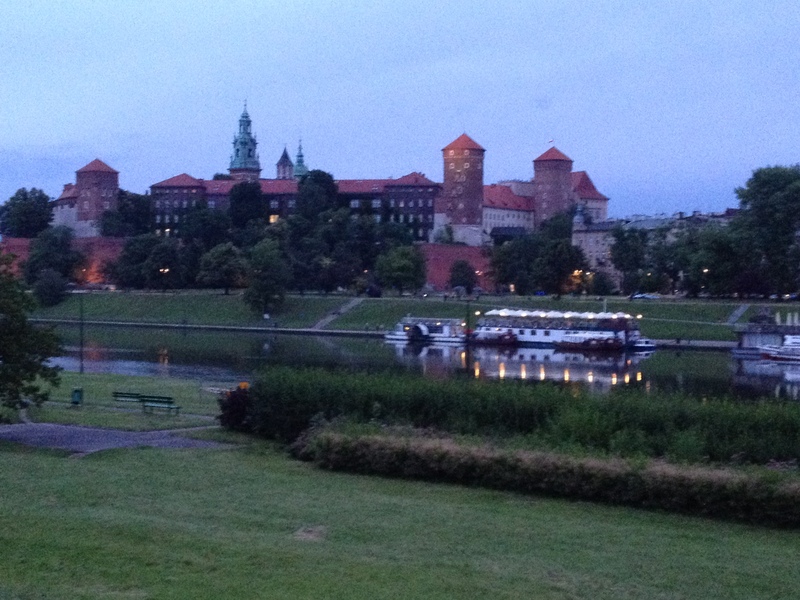 We left Chicago on June 20 and arrived in a rainy Kraków about 2:30 PM. After unloading at the Radisson Blu, we headed out for a stroll around the city. During two separate tours, we took in the Old Market Square and the Jewish quarter, but the real fun would begin today (6/22/15). 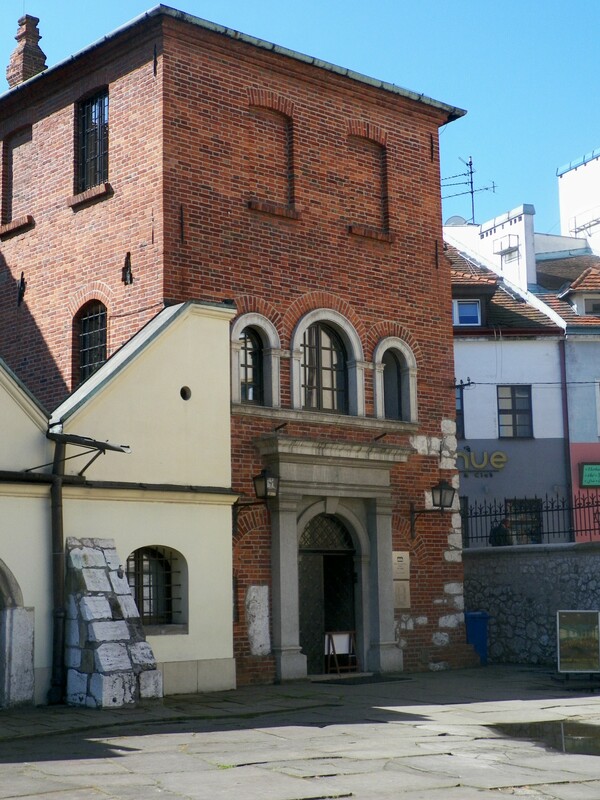 The Jews experienced a great deal of religious freedom here until 1494, when a fire destroyed a large part of Kraków. The Jews would be blamed for it, and Jan I Olbracht would move 1400 Jews to the Bawol district. 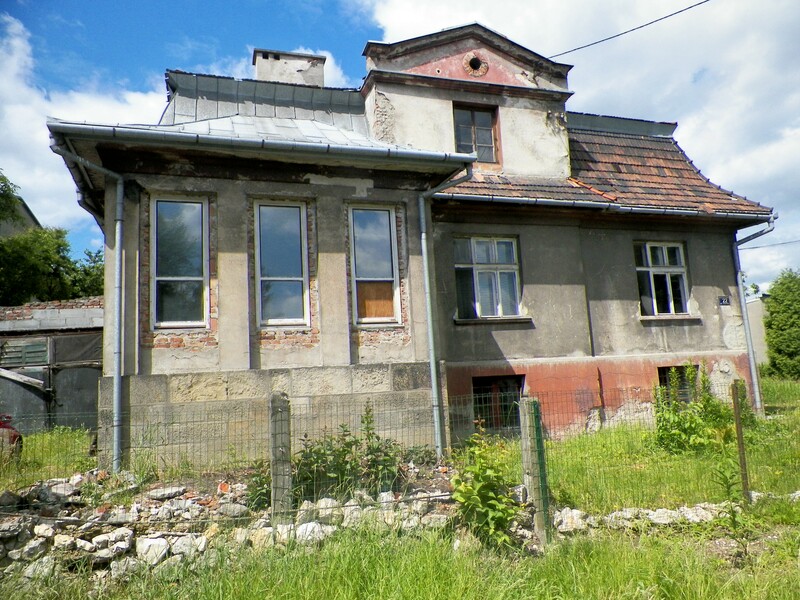 Eventually, there were 78,000 Jews moved to eastern part of Poland. By the end of 1800, they could move anywhere. 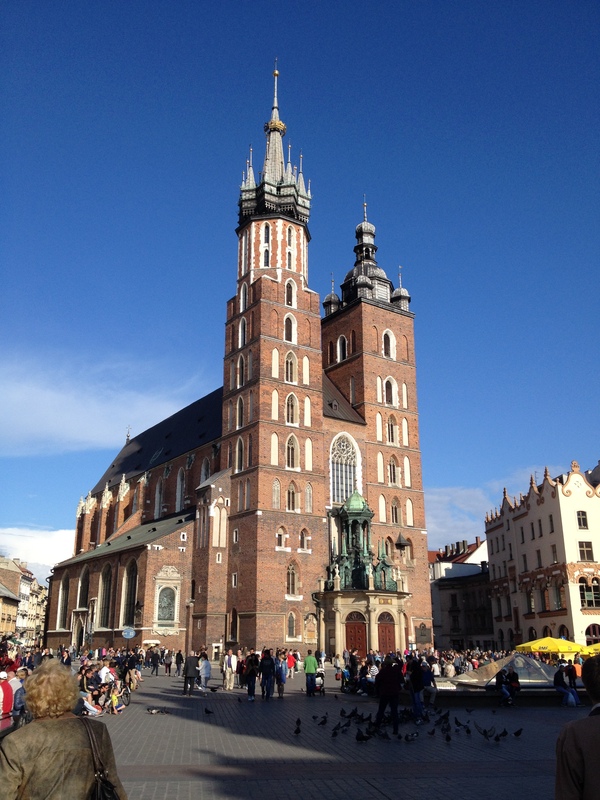 In Hitler’s time, Kraków became the capital of occupied Poland, which is the reason it was not destroyed. On March 3, 1941, Nazis set up a small ghetto in Kraków. They divided this area into two parts. The first part contained workers (those who were young and fit enough to carry out hard labor.) The second part consisted of the young, the old, and the infirm. It is this part that will be liquidated. Many Jews worked for Schindler, who moved his Catholics to other jobs when he realized what was going on and moved to help as many Jews as possible. He would eventually save 1,200. We then went to the deportation area of the Kraków Ghetto. 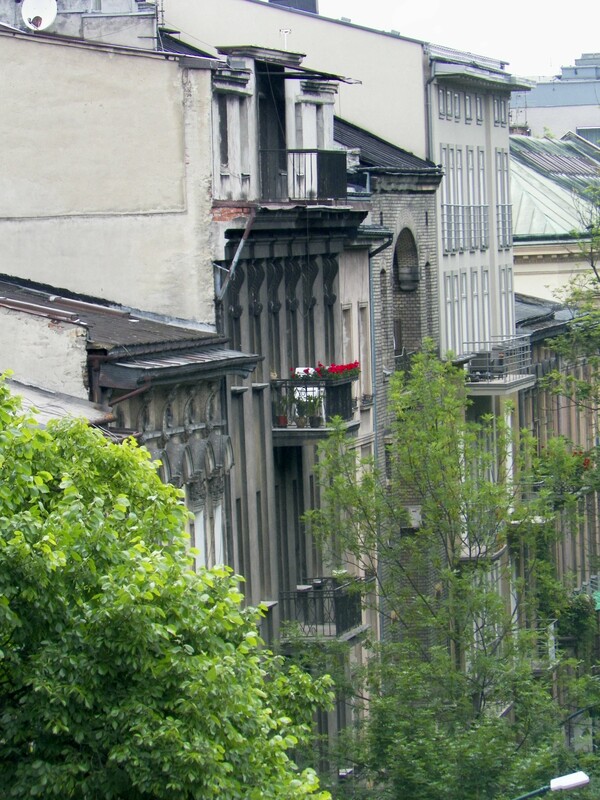 The Kraków Ghetto is the smallest ghetto, while the Warsaw Ghetto is largest. 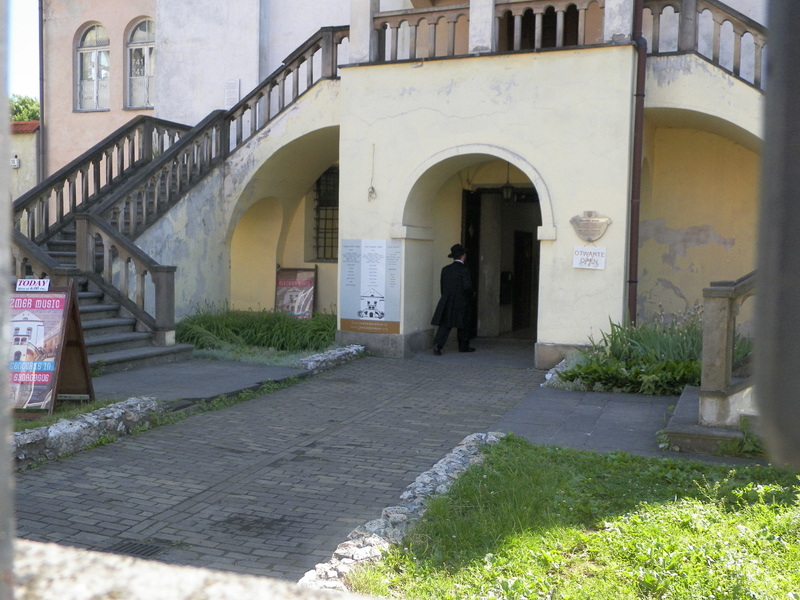 Before the ghetto was established, 3,000 Jews lived in the area that would become the ghetto. The largest amount in the ghetto was 20,000 in an 18 block area. 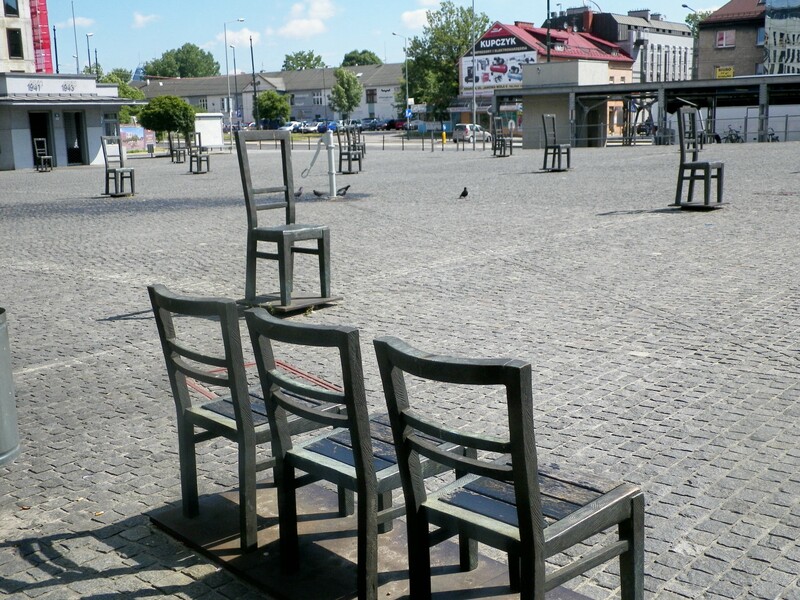 Because there were 68,000 Jews of Kraków killed, the Empty Chair Monument has 68 chairs to represent the 68,000 Jews executed here when ghetto was liquidated (Note: Other places say 70 chairs. I didn’t count.) There are two meanings they used chairs for the monument according to our tour guide. The first is that since Jews were often moved, they were told to bring their belongings. Because of that, chairs, tables, and wardrobes littered the area. The second meaning is to symbolize waiting to be exterminated, an idea reinforced by the Nazi’s who apparently made the ghetto wall in the shape of Jewish tombstones. 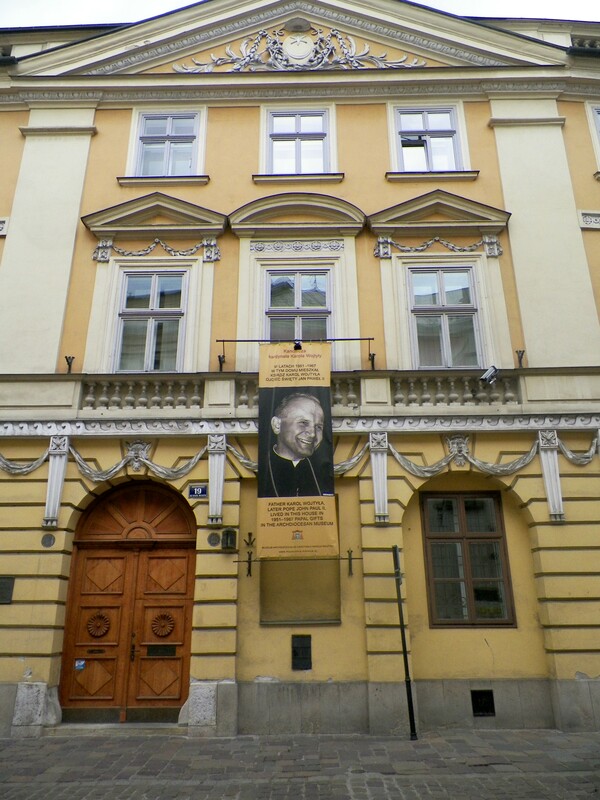 Another cool story from the Bohaterow Ghetto is the story of Dr. Tadeusz Pankiewicz. He was the only non Jewish person to operate a business inside the ghetto. He was allowed to keep his pharmacy as a service, but I doubt the Nazi’s know just how much of a service he performed. Observing what went on with the Jews from his spot just outside the square, he decided to help the Jews. In addition to medical care to ease the suffering, he provided tranquilizers to help Jewish children sleep through Gestapo raids. He also provided Jews with hair dye needed to change their appearance and help them get out of the ghetto. Additionally, his store served as a meeting place for other resisters, and a cover for Jews trying to escape. He truly was a remarkable man, and he has been honored by the Yad Vashem..
On our way to the Plaszow Concentration Camp, we learned that there were 9,000 working concentration camps. Originally, this camp held 2,000, but when the Bohaterow ghetto was liquidated, it swelled to 8,000. The built a gas chamber and crematorium there, but they were never used. In Schindler’s List, they made it in the construction phase because the camp was destroyed. Another inconsistency is that the camp is on the hill while Amongothe’s house is on the bottom. In the Camp, there is nothing left of the original buildings. All that remains is a series of monuments. 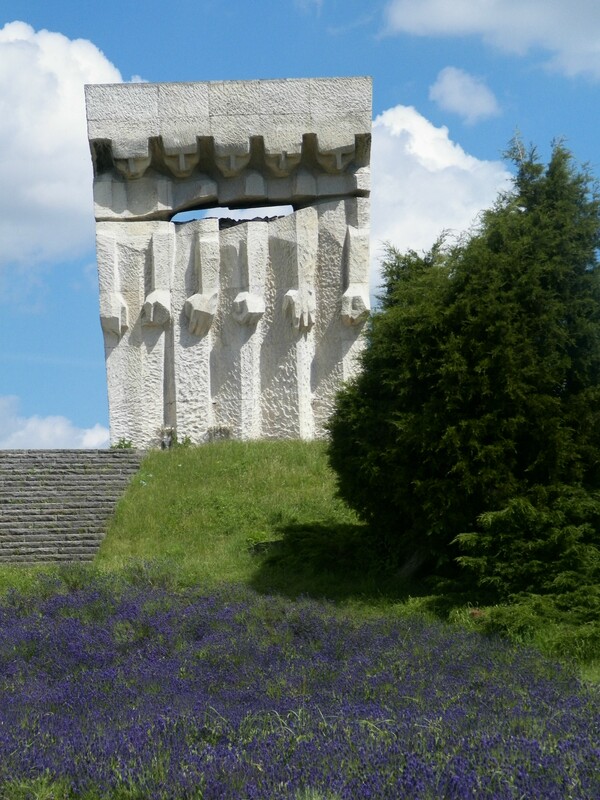 In addition to the large one pictured here, there is a small monument to the Hungarians who perished at Auschwitz (almost half a million towards the end of the war when they came from Hungary immediately to the gas chambers) because this camp was on the way to Auschwitz. There’s also a monument to Polish policemen, many of whom were also executed. After exploring the area around the monuments, a number of us chose to walk down to Amongoethe’s house. There is apparently a guard balcony in back, but it doesn’t look like sniper stand or anything you could use as such. 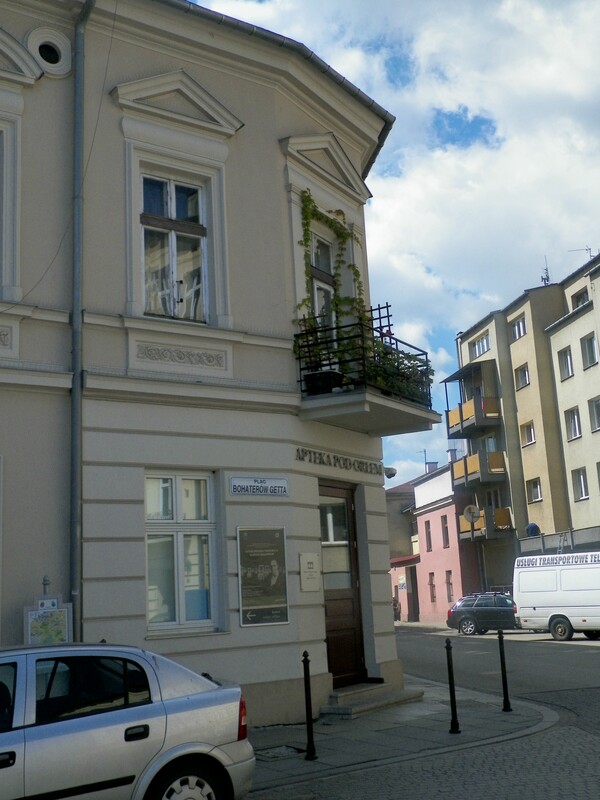 While I have yet to see Schindler’s List (a number of us are planning a movie night on our trip), one thing that I wanted to be sure to share is that Amongothe’s house was recently bought by an architectural firm who is planning to turn it into offices. This may be one of the last times to see it like this. From the camp, after lunch on our own in the city, we headed to the Basilica of the Virgin Mary. This spot boasts the two highest towers in the city.As such, they logically became the watch tower. There also was a bugler who played different melodies to warn, assemble, or celebrate. Legend has it that during the Tartar invasion, the man playing the warning melody was shot in throat mid-song. Because of this, a bugler will play the same melody every hour on the hour 4 times in the cardinal directions, stopping at the same spot as the man who was killed. It is an amazing sight to behold. 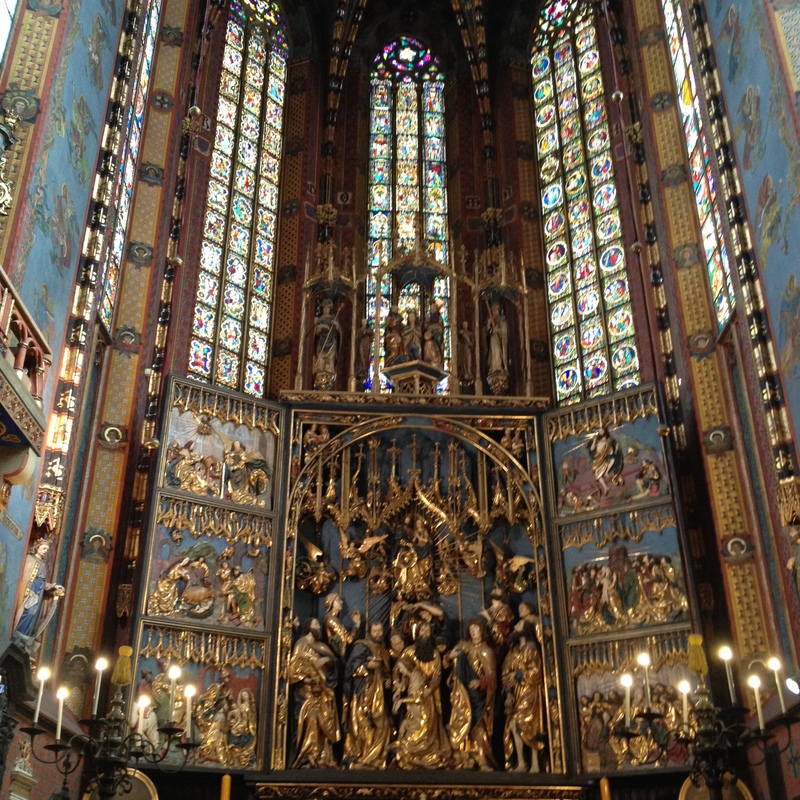 St. Mary’s boasts the oldest stain glass window in Poland. Additionally, the panels on the wall were considered the wordless Bible–a way to provide the uneducated with an understanding of the Bible. This alter had been found by the Germans who sent it to northern Poland. After the war, it would be returned. We ended our time at the Wawel Castle, built by Kazimierz (Casimir the Great) who was the last king in a 400 year dynasty.) Our tour guide shared some incredibly interesting stories with us. Because Kasimierz had no legitimate heir, the Polish and Hungarian kings agreed whoever died first, the other would be king of both countries. The Polish king died first. Not wanting to leave his kingdom, the Hungarian King gained permission for his ten year old daughter to become king of Poland (Yes, not Queen..). After 200 years of the second dynasty, one of the kings ordered tapestries to be made. 138 survived because they were sent to Canada during the war, and Canada kindly returned them. This tapestries took one man eighteen years to create or eighteen men one year. Many tapestries are on display on site. When that dynasty ended, the king was elected by Parliament: first French, Hungarian, then Swedish. The Swedish king moved the capital from Kraków to Warsaw to be closer to Sweden. During the war with Sweden, more Polish citizens were destroyed than during the Nazi regime. A queen would eventually defeat them. Surrounded by Russia, Prussia, and Austria-Hungary, it wasn’t long before they divided Poland between them starting in 1772. It became an Independent country on Nov. 11,1919. One interesting thing to see is the empty coffin of the first Bishop of Kraków who became the first Polish saint after being beheaded. (The Crusaders also occupied Poland because there were lots of pagans here, being the last non-religious country in Europe). In front of the tomb is a sculpture of a Bible with pages moving, representing the Bible with pages blowing from Pope John Paul II’s burial. On the Sculpted Bible is a vial containing the blood of Pope John Paul II. Other fun facts include the crowning of the royal family in front of crucifix and the fact that they were buried here until 1500. There are monuments to a number of kings inside. Two of the castles on this site burned. This one is third. It also boasts a tournament courtyard where knights used to joust. And, it is the biggest Renaissance castle in Europe, making its money from salt mine. We finished our day with an incredible dinner at Hawelka, before a group of us decided to go for a walk along the river at night. Indeed, it has been a Monumental day!